Bill Manaris is a computer science researcher, educator, and musician. 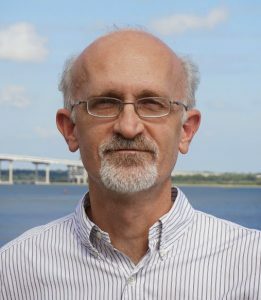 He is Professor and Interim Chair of Computer Science, and Director of the Computing in the Arts program, at the College of Charleston. His areas of interest include computer music, human-computer interaction and artificial intelligence. He explores interaction design, modeling of aesthetics and creativity, sound spatialization, and telematics. With his students, he designs systems for computer-aided analysis, composition, and performance in music and art. He also works in music information retrieval and computational musicology (with a deep interest in Zipf’s law, the golden ratio, and their application in music and art). Earlier, he worked in natural language processing and speech recognition. As an undergraduate, he studied computer science and music at the University of New Orleans, and holds M.S. and Ph.D. degrees in Computer Science from the University of Louisiana. He has also studied classical and jazz guitar. He has published a textbook in Computer Music and Creative Computing with Andrew Brown. His research has been supported by the National Science Foundation, the Louisiana Board of Regents, Google, IBM, and the Stavros Niarchos Foundation. For more information, see CV.